The Bahco S877 Socket Set includes 1/4in and 1/2in square drive sockets and combination spanners with dynamic drive profile. 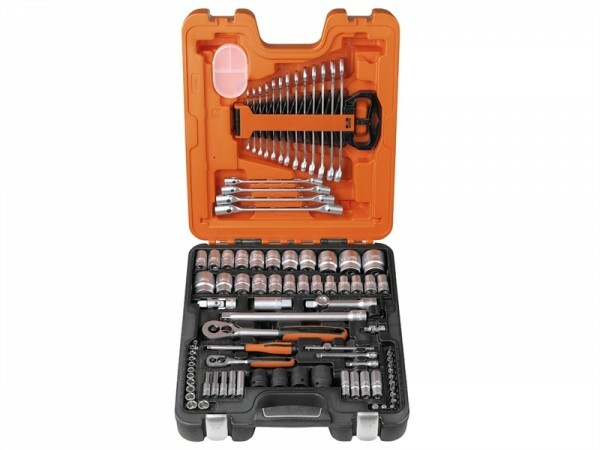 The set is supplied in a three component impact and oil resistant case with removable tool rack for the combination spanners. 12 x 1/4in Hex Deep Metric Sockets: 4, 5, 6, 7, 8, 9, 10, 11 & 13mm. 15 x 1/2in Hex Metric Sockets 10, 12, 13, 14, 15, 16, 17, 18, 20, 21, 23, 24, 27, 32 & 34mm. Hex Impact Sockets 17, 19, 21 & 24mm. 1 x 1/4in 100mm Sliding T-Bar. 1 x 1/4in Universal Joint, 1 x 1/2in Universal Joint. 1 x 1/4in Spinner, 1 x 1/4in Reversible Ratchet. 2 x 1/2in Extension Bars 125 & 250mm. 1 x 1/2in Spark Plug Socket: 21mm (13/16in). 1 x 1/2in T Adaptor, 1 x 1/2in x Reversible Ratchet. 3 x Hex Keys: 1.5, 2 & 2.5mm. 4 x Flex Head Spanners 8x9mm, 10x11mm, 12x13mm & 14x15mm. 13 x Combination Spanners 7, 8, 9, 10, 11, 12, 13, 14, 15, 16, 17, 18 & 19mm. 1 x Impact & Oil Resistant Case. 1 x Removable Tool Rack for Combination Spanners.